What can Ornn do in the right hands? Well, I’m thinking more of a competitive edge. Ornn’s passive allows allies to buy one upgrade for 8 specific items. A Rioter provided a list of the items, which is below. We don’t have the numbers on his abilities yet, but if these upgrades are worth their gold, it could give teams the advantage in fights late game by allowing every champion access to bonus stats for the right price. The 8 items Ornn allows his allies to purchase upgrades for. 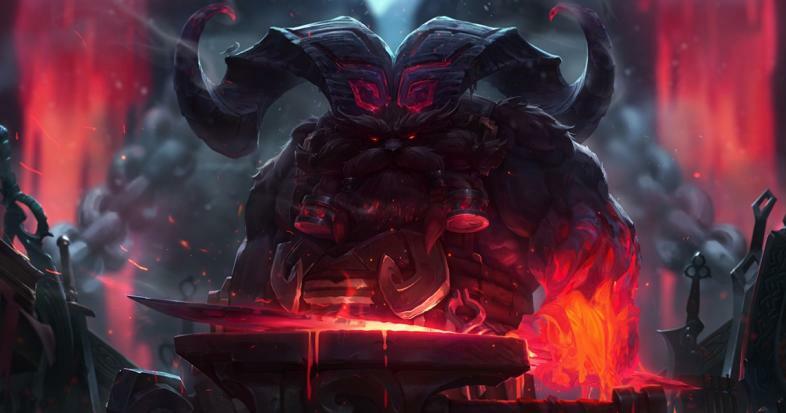 Ornn’s other part of his passive allows him to forge items from anywhere on the Rift when he’s out of combat. This process takes a few seconds each time, but makes his sustain and outplay potential immense. For example, he gets a first tower top lane but knows there’s a gank coming his way. He can forge a defensive item to try to survive the fight, or forge an offensive item to attempt to duel whoever comes his way. Again, we’re not sure on the numbers yet, so offensive items or defensive items might not be optimal, but either way, you still have the option. The numbers people really want to know are Ornn’s main abilities (Side note: the PBE uses experimental numbers). His Q (Volcanic Rupture) seems akin to Trundle’s pillar of ice, but with damage attached. Ornn’s W (Bellows Breath) makes him unstoppable, gives him a shield, and makes him spit fire. This fire applies a new status effect, Brittle. Brittle’s effect is that crowd control effects last longer on a Brittle enemy, and when crowd control is applied to a Brittle enemy, they suffer a portion of their maximum health. Ornn’s basic attacks also apply a small knockback to Brittle enemies. His E (Searing Charge) is a straight dash with an extra effect when Ornn collides with terrain. If the terrain is player created (I.E. Taliyah’s Ult) it will be destroyed. If it is normal Rift terrain, a shockwave is created that deals damage and applies a knockup. Finally, Ornn’s ultimate summons a giant flaming ram that applies the Brittle effect, like his W. Ornn can use Searing Charge on the ram to change the direction it is running, and allow it to apply a knockup in addition to its previous effects. Ornn’s kit appears to synergize very well with itself and with crowd control-laden supports, such as Leona. Applying a slow and blocking off his enemies with Volcanic Rupture, then using Searing Charge to slam them into the newly created terrain so he can get off the full damage of Bellows Breath. Then, his ultimate can pull the tide of a fight by increasing the length of crowd control effects for multiple targets. In competitive play, this can potentially shut down whole fights by chaining crowd control on a key target. Once Ornn is on the LCS patch, I’m sure we’ll all be on the edge of our seats waiting for him to hit the Rift, as it was with Kayn.